Christmas is a great time for crafting, but it can be hard to find time to finish a big project. 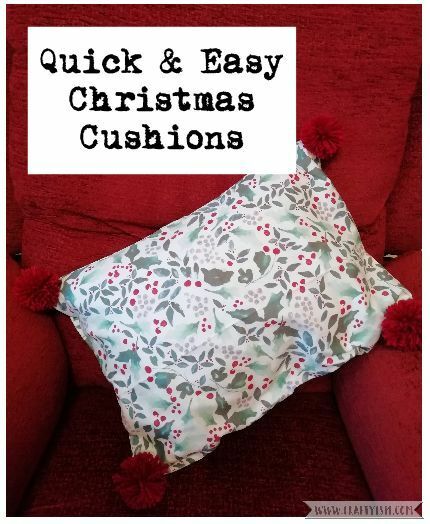 I’ve come up with these super quick and easy Christmas pompom cushions made out of a tea towel! 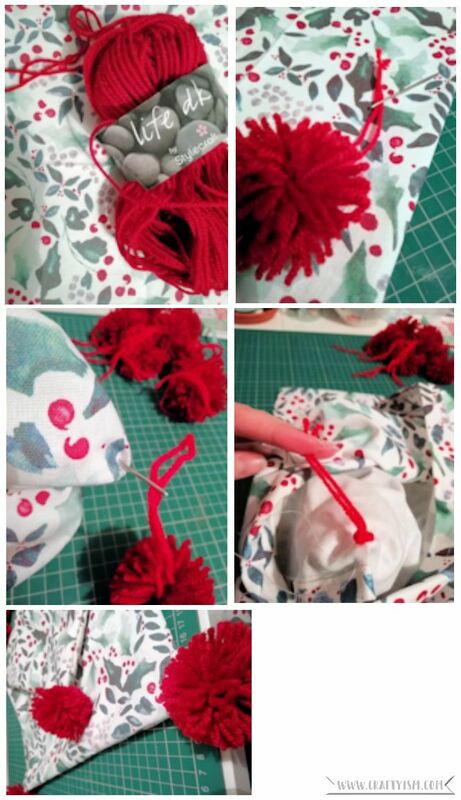 There’s only two lines of sewing and with the invention of pompom makers, it’s quick to make four fun corners. You can make one of these in well under an hour. So if you need a quick Christmas craft fix, this might be the projects for you. Lay out a tea towel with the design facing up. Fold down the top third and hold down with a cat’s tail (a cat tail is optional!) Pull up the bottom edge of the tea towel until it is about 5cm from the top and place over the previous fold. Pin the sides to hold them together. Sew two straight lines along the sides of the tea towel, following the hem. Remove the pins and fold the tea towel right sides out. You will see it has created a big envelope shape! Lastly, pick some wool that matches the colours in your tea towel. I have gone for a Christmas red! Use this to make four pompoms – one for each corner. You can do this with a pompom maker or look up how to do it the old-fashioned way with cardboard circles. When you tie the pompom together, leave a long tail and thread this onto a wool needle. Pass the needle through the corner point of the tea towel cushion and through to the inside. Tie a large knot in the wool to secure. Finally, insert an old pillow or cushion into the cover. Alternatively, fill it with an old jumper or bundle of scarves, anything as long as it’s squishy! It’s so quick to make and looks really festive! I managed to make two in just under an hour. Why not whip a few up to have in a stash of emergency presents. And don’t forget to look out for discounted Christmas tea towels in the end of year sales. If you have a Christmas tea towel but don’t want to make a cushion, how about making a shopping bag?